Bishop-elect Joseph Coffey, a priest of the Archdiocese of Philadelphia in active chaplain service with the U.S. Navy, will be ordained an auxiliary bishop for the Archdiocese of Military Services for the USA, March 25 in Washington, D.C.
Father Joseph L. Coffey, 58, a priest of the Archdiocese of Philadelphia serving as an active military chaplain with the U.S. Navy since 2001, is one of two priests named an auxiliary bishop for the Archdiocese for the Military Services, USA, Jan. 22 by Pope Francis. Also appointed an auxiliary bishop was Father William J. Muhn, 61, a priest of the Archdiocese of New York and a former military chaplain. In a statement, Archbishop Charles Chaput said the announcement “marks a moment of great joy for our local church. This appointment by the Holy Father continues a long and generous tradition of episcopal service to the Universal Church by priests from the Archdiocese of Philadelphia. It also demonstrates Pope Francis’ confidence in Bishop-elect Coffey, who has served with faithful devotion for many years. “As Bishop-elect Coffey prepares to begin his episcopal ministry, I offer him heartfelt congratulations on behalf of the priests, deacons, religious and lay faithful of the Archdiocese of Philadelphia. I’m confident that he will carry out his duties with great energy, compassion, zeal and fidelity, and I pray that the Holy Spirit will strengthen him as a successor of the apostles. Bishop-elect Coffey is the middle of the nine children of the late Dr. William Coffey and the late Roseanita (Schubert) Coffey of St. Matthias Parish, Bala Cynwyd. He attended the parish school followed by Archbishop Carroll High School, from which he graduated in 1978. He graduated from La Salle University, with a year at the Sorbonne in Paris, in 1982 with a bachelor’s degree in English and French. After college he worked first as an elementary school teacher, then as a ski instructor in Switzerland and finally in the automotive field in Germany and Belgium. Actually, according to his brother Jim, he was selling automobiles to members of the military, which may be the genesis of his desire to become a military chaplain after he realized his vocation was to the priesthood. He entered St. Charles Borromeo Seminary at age 30 and while at the seminary, with the permission of Cardinal Anthony Bevilacqua, he entered a U.S. Navy Chaplain Candidate Program and became a member of the Navy Reserves. Father Coffey was ordained May 18, 1996 by Cardinal Bevilacqua at the Cathedral Basilica of SS. Peter and Paul. At that time, it was his wish to become a full-time Navy chaplain, but Cardinal Bevilacqua requested he wait five years. In the meantime, he served as parochial vicar at St. Katherine of Siena Parish, Philadelphia. During this period, he also had various secondary assignments including spiritual director of the Legion of Mary’s Holy Family Curia in Northeast Philadelphia; U.S. Navy Reserve chaplain; archdiocesan Department of AIDS Ministry, and member of the archdiocesan Council of Priests. He was released for full-time military service in the Navy in 2001 and served in various assignments around the country, abroad and at sea, ministering to both sailors and Marines who also come under the Department of the Navy. This included two year-long tours aboard the aircraft carrier USS George Washington and a year-long tour aboard the aircraft carrier USS Ronald Reagan. Father Coffey’s service was such that he was named Navy Chaplain of the Year in 2004. Perhaps his most hazardous assignment was the year he served with a Marine assault battalion in Afghanistan 2011-2012, where on Christmas Day he celebrated five Masses at various locations. 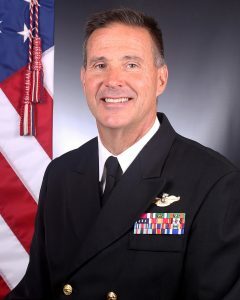 He has earned numerous military awards including the Meritorious Service Medal, the Navy Commendation Medal with two gold stars, the Navy Achievement Medal with two gold stars, the Navy Sea Service Medal, the National Defense Medal, the War on Terrorism Expeditionary Medal, the War on Terrorism Service Medal, and the NATO Service Medal, three Battle E Ribbons. Over the past 17 years of active duty he has risen to his current rank of Captain (Select), serving in Cape May, New Jersey; Camp Pendleton, California; St. Louis, Missouri and most recently San Diego, California. Of his being raised to the office of bishop, Bishop-Elect Coffee said, “I am humbled and honored to have been chosen by the Holy Father, Pope Francis to assist Archbishop Broglio in his duties as the chief shepherd for the AMS. I am extremely grateful to my three shepherds from the Archdiocese of Philadelphia, Anthony Cardinal Bevilacqua, Justin Cardinal Rigali and Archbishop Charles J. Chaput, who gave me the necessary permission to serve on active duty in the U.S. Navy Chaplain Corps for these last 17 years. “I have been so blessed to have had two loving parents who gave me the gift of life and sharing the Catholic faith with me and a very large extended family. I have tried to share that with the good people of St. Katherine’s Parish as an assistant pastor and the sailors, marines and ‘coasties’ that I have served with as a priest chaplain. Bishops-elect Joseph Coffey and William Muhn will be ordained bishops by Archbishop Broglio at the Basilica of the National Shrine of the Immaculate Conception in Washington, D.C., on March 25, the feast of the Annunciation. Father Coffey is the second Philadelphia priest and U.S. Navy chaplain to be named bishop for the Military Services. The first was Father John J. O’Connor (1920-2000), later Bishop of Scranton and Cardinal Archbishop of New York. So very happy for you. Looking forward to your next promotion! Our prayerful best wishes to Bishop-elect Joseph Coffey. You will continue to be a gift to the Military by your service to them. We thank God for you. of the special trust given you. May Mother Mary guide you in your service to the most high Jesus Christ. Congratulations Fr. Coffey – Bishop -elect. What an interesting Catholic background; great family life, college grad before entering the seminary, worked in the real world, traveled internationally and multi-lingual. A great background formation for the Priesthood. Can’t wait to read the full story in the coming issue of “Salute”. Be sure to talk to Bishop Higgins (Bishop Protector of the Catholic War Veterans) about our great Catholic War Veterans of the USA. – May God Bless you abundantly as you continue to serve the Men and Women in the Military Service of the United States of America. You are in our prayers. May Fr. Capodanno intercede for you before Our Lord. – CWV Post 1306. – Semper Fi. Congratulations on your next chapter of your life. I am praying for you to help keep the Sailors as well as any arm of our military, to remain faithful to our Mother church as Catholics. From experience with major trauma I am eternally grateful for the opportunity to work with Father David Waters who literally dragged my spirit back from near death. We need more men like you to not only serve our country; to serve God in the world of adversity out there. Congratulations to Bishop-elect Coffey. Bill and Roseanita would be proud — but not surprised.